The search for the missing Malaysia Airlines continues, with recent evidence suggesting that the aircraft may have flown for at least four hours beyond its last known position. The following graphic published 14 March 20114 by the Washington Post illustrates the possible maximum range of the aircraft given the amount of fuel it had at takeoff (about seven hours worth), and the maximum range assuming four hours of flight after last contact. Potential locations: Countries within a radius of four hours flying time (2,400 statue miles or about 3,900 km) include parts or all of Australia, Indonesia, Philippines, China, Taiwan, India, Bangladesh, Nepal, Palau, East Timor, and the Maldives Islands. Bodies of water include parts or all of the South China Sea, the Sea of Thailand, the Andaman Sea, the western Pacific Ocean, and the central and eastern Indian Ocean. 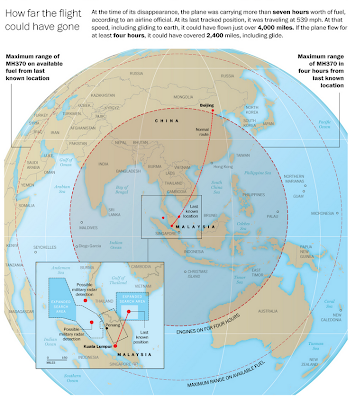 Potential size of the search area: A circle with a radius of 2,400 statue miles has a surface area about 18,095,600 square miles, or 46,847,250 square km, is an area slightly bigger than the combined surface areas of the US, Canada, Mexico, Australia, Brazil, and China. The Washington Post illustration here is wrong as it doesn't even include Beijing, the original destination. With contingency fuel on board the circle should be greater. Have another look Graham. The outer circle is way out further than Beijing! 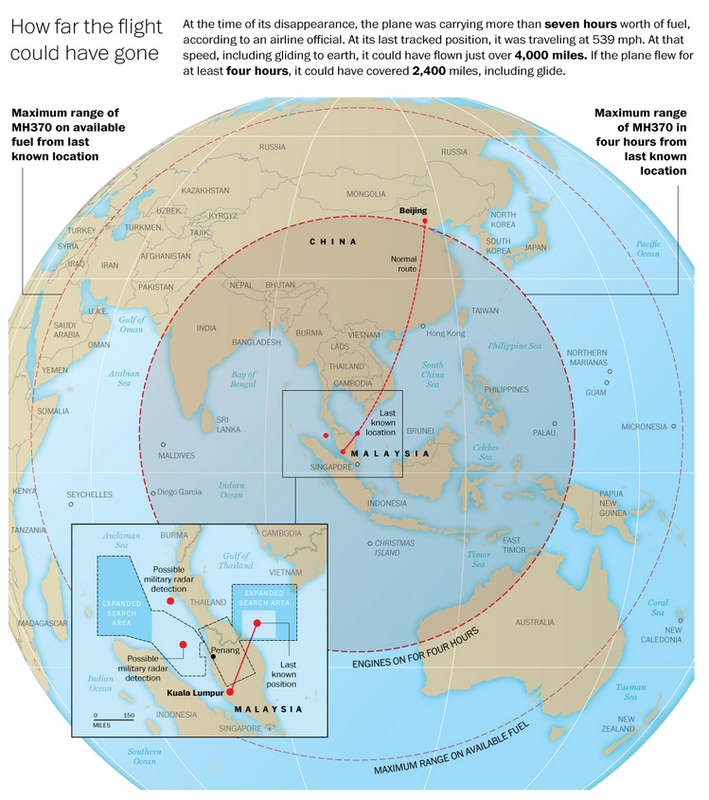 Could the plane have flown high enough to get vaporized? Or float in space?